IT NEVER ceases to amaze me how things can unexpectedly fall into place, out of the blue, like it was just meant to be. Over the past few years we have been pestered by certain daughters that we should get a pony. It has never been something that came into our thinking, as we didn’t have the time, the space or the money to take a ride down that little road, but lately of course, things have changed, because we now have the space. We decided recently that we would do some homework on Shetland Ponies and once we had all the facts we would then consider if it was time to add to our growing family of animals. We nearly found what we were looking for about six weeks ago and thought we were onto a winner, but it wasn’t to be and afterwards we were a little disheartened that things didn’t work out as we intended. It’s been said to me many times, “as one door closes, another one opens” and sure enough, a little patience was all that was required. It was a beautiful sunny afternoon on Long Meadow Farm and we were just winding down from a busy day in the Tea Garden when a lovely couple noticed us as they were passing by. They decided they would pop in for a gander and see what this homemade ice cream was all about. We were chatting away, just talking about what we were getting up to, when the gentleman asked if we had any horses. I said no but we had recently been on the hunt for a miniature Shetland, we just hadn’t been successful so far. At that, I was a little taken aback. The gentleman went on to explain the story. 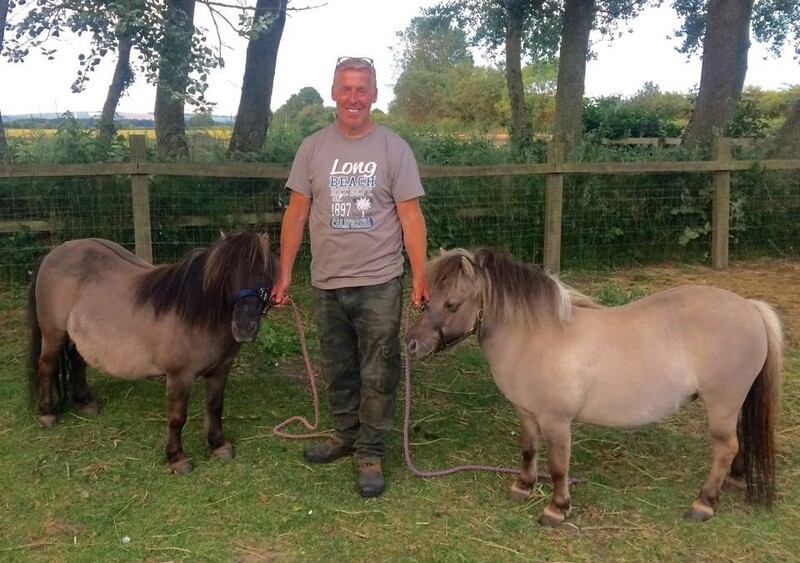 For the last decade or so his health had been deteriorating badly and although he had been breeding mini Shetland ponies for almost 30 years, the concerns with his health meant it was time to find a new home for his ‘little girls’. I later found out that for more than two years he had been seeking the right home and when he spoke with us, he said that he felt like his prayers had been answered. We made arrangements to go and meet the two ponies and they were beautiful. That was it, our decision was made, they were joining the McKenna family. As I’m sure you can imagine we were doing a lot of reading up ahead of their arrival, but on Friday evening we brought Maisie and Lucy home. We know it has been tough for the couple to part with their precious ponies but we will take great care of them and I’m sure they will be pampered regularly, without too many treats, of course! In fact they already have their manes plaited and get taken for a run several times a day, long may it continue, it’s good to see the girls getting stuck into some real farm graft. It has been like musical paddocks round here this week, as just before the ponies arrived, we were bidding a fond farewell to our tups, Torridon and Rambo who were off to pastures new. Monica and Lyndsey, two of our Highlands were also on their travels, but they were only leaving for a couple of months, as they were off to have a party with Mr Bull. Hopefully, come next April, we will have not one but two bundles of Ginger joy down on the farm.